Blue Lizard® Australian Sunscreen Win a Family Trip to Australia Sweepstakes – Win a trip to Australia! ENTER SWEEPSTAKES HERE – Blue Lizard Sweepstakes page. ENTRY LIMIT – Limit of one (1) entry via Website per Internet-connected device per day during the Promotion Period. 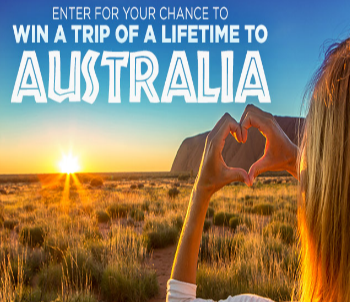 ELIGIBILITY – The Blue Lizard® Australian Sunscreen Win a Family Trip to Australia Sweepstakes is open only to legal U.S. residents who are at least eighteen (18) years old and have internet access and a Facebook account at the time of entry. SWEEPSTAKES ENTRY PERIOD – The Promotion begins on February 21, 2018 at 9 a.m. Pacific Time (“PT”) and ends on September 5, 2018 at 11:59 a.m. PT. PRIZES – ONE (1) GRAND PRIZE WINNER: The Grand Prize winner will receive a 7 day, 6 night trip for four (4) to Australia, including airfare, lodging and activities. The Approximate Retail Value (“ARV”) of Grand Prize is $12,000.00. Actual value may vary. Any stated difference between the approximate value and actual value of Grand Prize or any substituted prize will not be awarded. TWENTY-EIGHT (28) WEEKLY PRIZE WINNERS: Each Weekly Prize Winner will receive a Blue Lizard prize pack which may consist of a beach towel, cooler, hat, sunglasses, free Blue Lizard product and more as determined by Sponsor in its sole discretion. ARV of each Weekly Prize is $65.00.